Original Editors - Jen Bognich from Bellarmine University's Pathopysiology of Complex Patient Problems project. Non-Hodgkin's lymphoma (NHL) is "a group of lymphomas affecting lymphoid tissue and occurring in persons of all ages." "The lymphoid malignancies present as solid tumors arising from cells of the lymphatic system. The lymph nodes are usually involved first, and any extranodal lymphoid tissue, particularly the spleen, thymus, and GI tract, may also be involved. The bone marrow is commonly infiltrated by lymphoma cells, but this is rarely the primary site of a lymphoma. Lymphomas are classified according to the World Health Organization (WHO) which relies on the histochemical, genetic and cytologic features of the cells. Lymphomas are classified as either B-cell or T-cell lymphomas." "NHL can affect any age range of individuals. It is more common in middle aged adults between the ages of 40 to 60." "NHL comprises a large group of lymphoid malignancies (about 30 different specific types) and affects over 67,000 people per year, making this the 5th most common cancer in the United States." In the United States in 2009, there were 65,980 new cases diagnosed and 19,500 deaths from non-Hodgkin lymphoma. Diffuse large B-cell lymphoma: is one of the more common types on non-Hodgkin lymphoma in the U.S. and affects about 1 out of 3 cases (or 33%). Follicular lymphoma: affects about 1 out of 5 cases of non-Hodgkin lymphoma in the U.S.
Small lymphocytic lymphoma: accounts for about 5% to 10% of all lymphomas. Mantle cell lymphoma: accounts for about 5% of lymphomas. Marginal zone B-cell lymphomas: account for about 5% to 10% of lymphomas. Primary mediastinal B-cell lymphoma: accounts for about 2% of all lymphomas. About 2 out of 3 people with this type are females in their 30s. Burkitt lymphoma: accounts for about 1% to 2% of all lymphomas. Close to 90% of patients with this type are males in their 30s. Lymphoplasmacytic lymphoma: accounts for 1% to 2% of all lymphomas. Hairy cell leukemia: is rare but accounts for about 1,000 people in the U.S. each year. Precursor T-lymphoblastic lymphoma/leukemia: accounts for about 1% of all lymphomas. "NHL presents in a similar manner as Hodgkin's disease, but NHL is usually more widespread and less predictable. The disease starts in the lymph nodes, although early involvement of the oropharyngeal lymphoid tissue or the bone marrow is common, as is abdominal mass or gastrointestinal involvement with complaints of vague back or abdominal discomfort." "The most common manifestation is painless enlargement of isolated or generalized lymph nodes of the cervical, axillary, supraclavicular, inguinal, and femoral (pelvic) chains." "The development of these enlargements may occur slowly & progressively or rapidly depending on lymphoma type (indolent or aggressive)." "Indolent disease may be minimally active & treatable for many years." "Extranodal sites of involvement may include the nasopharynx, GI tract, bone, thyroid, testes and soft tissue. Abdominal lymphoma may cause abdominal pain & fullness, GI obstruction or bleeding, ascites, back pain & leg swelling. Lymph node enlargement in the chest can lead to compression of the trachea or bronchus, causing shortness of breath & coughing." "Primary CNS lymphoma is a NHL restricted to the nervous system. Presenting symptoms may include: headache, confusion, seizures, extremity weakness/numbness, personality changes, difficulty speaking & lethargy. (Prior to the spread of HIV, this type of lymphoma was rare.)" "Studies in the 1990s linked NHL to two widespread environmental contaminants: exposure to benzene & polychlorinated biphenyls (PCBs). Benzene can be found in cigarette smoke, gasoline, industrial pollution & 70% comes from automobile emissions. PCBs are found throughout the food chain (highest in meats, dairy & fish products)." The development of NHL secondary to immunodeficienies may be due to a decrease in the host's surveillance mechanism against transformed cells and their inability to mount an adequate immune response (attack). 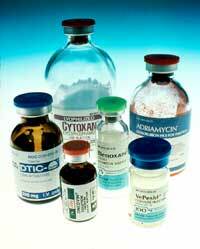 "The most common chemotherapy combination is CHOP (cyclophosphamide, doxorubicin, vincristine & prednisone). Another combination omits the doxorubicin (because of the effects on the heart) and is called CVP. Other agents include chlorambucil, fludarbine, & etoposide. Since many risk factors for NHL are associated with a reduced immune system, immune modulators, such as interferon and monoclonal antibodies, have been employed to combat NHL." "Combining the monoclonal antibody rituximab (Rituxan) with chemotherapy (CHOP) has produced high rates of response and is the treatment of choice for many NHLs. Clinical studies suggest that the immune modulator rituximab may alter the sensitivity of B-cell lymphoma to chemotherapy as well as induce apoptosis and cause the lysis of B cells." "Bone marrow transplant (BMT) may be used for patients who replace or do not completely respond to treatment (which often occurs with aggressive lymphomas). Combined with intensive chemotherapy, BMT can be curative. In 2002, 4,300 BMTs were performed." "For some lymphomas, chemotherapy becomes palliative because of an inability to overcome drug resistance within the lymphoma cells; attempts at overcoming specific drug resistance mechanisms have had limited success. Other strategies involve the use of antigen-presenting cells for taking up, processing, & presenting tumor protein in a vaccine strategy. This may provide a new tumor cells that persist following therapy. Radioimmunotherapy, radioactive labeling of a monoclonal antibody, is also under investigation to provide targeted therapy & provide tumor-free grafts for transplant." "The optimal management of women with NHL who are pregnant requires special considerations because of the poor prognosis without treatment. Treatment during the first trimester should be avoided due to the risk of harm to the fetus, but the patient should receive chemotherapy during the second and third trimester despite the potential risk to the fetus." Physical Exam & History: An exam of the body to check general signs of health, including checking for signs of disease, such as lumps or anything else that seems unusual. A history of the patient's health habits and past illnesses and treatments will also be taken. Blood Chemistry Studies: blood sample is checked to measure the amount of certain substances released into the blood by organs & tissues in the body. An abnormal count can be associated with a sign of disease in the organ or tissue. Lymph Node Biopsy: is viewed by a pathologist to look for cancer cells. Bone Marrow Aspiration & Biopsy: is the removal of bone marrow, blood & a small piece of bone from the hip or breastbone. Liver Function Tests: the blood is checked for the enzyme lactate dehydrogenase (LDH). LDH levels help determine the prognosis and chance of recovery. "Accurate diagnosis is important because of the other clinical conditions that can mimic malignant lymphomas (infection, tuberculosis, SLE, lung & bone cancer). Molecular genetic techniques that take advantage of the clonal nature of this malignancy are now being used to better characterize & diagnose the lymphomas. A biopsy is required to confirm the underlying cause of persistent enlargement of lymph nodes present." "CT scans of the chest, abdomen and pelvis are helpful in staging, while MRI is used to image the brain and spinal cord. Bone marrow may be examined for staging and peripheral blood may be tested, but blood abnormalities are not present until the disease is in an advanced stage. If clinical symptoms warrant, a lumbar puncture for spinal fluid may be performed. Immunohistochemistry, flow cytometry or cytogenetic testing is often done to distinguish one type of NHL from another." "The gallium scan using radiotracer, gallium-67, uptake is 85% to 90% accurate to predict residual disease after chemotherapy and is able to differentiate between active tumor tissue and fibrosis. PET imaging is becoming more widespread and can be performed to aid in the initial diagnosis and help ascertain if a lymph node is malignant or benign. PET is also used following chemotherapy (frequently along with CT) to determine if the lymphoma is reduced in size and the treatment is effective." "Most lymphomas start in a type of white blood cells called B lymphocytes, or B cells. For most patients, the cause of this cancer is unknown. According to the American Cancer Society, a person has a 1 in 50 chance of developing non-Hodgkin's lymphoma. High-risk groups includes those who have received an organ transplant or who have a suppressed immune system." "Several possible etiologic mechanisms are hypothesized for NHL. Immunosuppression, possibly in combination with viruses or exposure to certain infectious agents, could be the primary cause." The other causes may be related to the associated risk factors. "Good prognostic features include age under 60 years, limited disease at diagnosis (stage I or II), lack of extranodal disease, and a normal lactate dehydrogenase (LDH) level. Individuals with NHL survive for long periods when involvement is only regional. The presence of diffuse disease reduces survival time. The indolent lymphomas are usually systemic & widespread and a cure cannot be achieved, whereas intermediate and fast-growing lymphomas are more likely to be treatable & even curable but require aggressive therapy." "The prognosis for people with high-grade lymphomas depends on their response to treatment. More specifically, DLBCL can be cured in 40% to 50% of clients with therapy, follicular lymphoma has a 5-year survival of 60% to 70% (although it is eventually fatal), 20% of patients with mantle cell are alive at 5 years, and Burkitt's lymphoma has a 50% 5-year survival with intensive therapy. In general, the 5-year survival rate for NHL is 63% and the 10-year survival rate is 49%." "Traditionally high-grade NHL associated with AIDS was synonymous with an extremely poor prognosis. But the advent of antiretroviral therapy for HIV the survival rates have approached those seen in individuals without HIV. Prognostic indicators for decreased survival rates in HIV-NHL include age greater than 35 years, history of injection drug use, CD4 cell count less than 100/100 ml, a history of AIDS before the diagnosis of lymphoma stage III or IV disease, and/or elevated LDH levels." Lymph nodes: get bigger when they fight infection and are called reactive nodes or hyperplastic nodes and are often tender to the touch when fighting an infection. An enlarged lymph node is not always a sign of a serious problem, but at the same time is the most common sign of lymphoma. Spleen: is an organ located under the lower rib cage on the left side of the body. The spleen makes lymphocytes and other immune system cells to help fight infection. It also stores healthy blood cells & filters out damaged blood cells, bacteria & cell waste. Thymus gland: is located behind the upper part of the breastbone and in front of the heart. Before birth, the thymus plays a vital role in development of T lymphocytes. Even though the thymus shrinks over the first 20 years of life it continues to play a role in immune system function. Adenoids & Tonsils: are collection sites for lymphoid tissue located at the back of the throat. They help make antibodies against germs that are breathed in or swallowed. They are easy to see when they become enlarged during an infection or if they become cancerous. 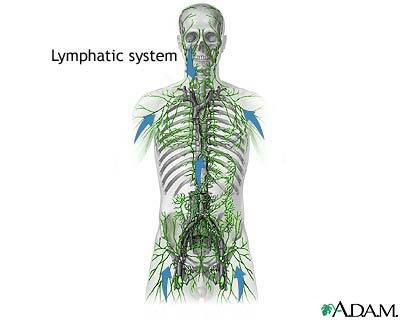 Digestive Tract: the stomach and intestines as well as many other organs also contain lymphoid tissue. Bone Marrow: is the soft inner part of certain bones that make red blood cells, blood platelets & white blood cells. WBCs (granuloocytes & lymphocytes) main job is to fight infection. Bone marrow lymphocytes are primarily B cells. 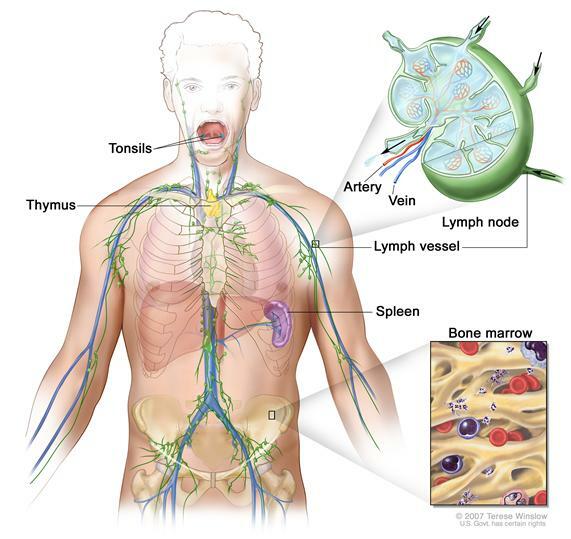 Lymphomas sometimes start from bone marrow lymphocytes. Alkylating Agent: A cytotoxic (toxic to cells) agent that inhibits cell division by reacting with DNA. Nucleosides: These inhibit DNA and RNA replication and thereby prevent cancer cells from growing. There is research being done to develop a vaccination against lymphoma. The vaccine itself is made by extracting cells from lymph nodes and identifying a cancer marker, called an "idiotype," that is unique to each patient. This idiotype is then fused with chemicals designed to stimulate the immune system. This vaccine have shown promising results but are not able to cure anyone who currently has lymphoma or prevent anyone from developing lymphoma. The vaccination is a form of chemotherapy and has shown significant success in lengthening the time period before the cancer returns. "Exercise, even if it is only minimal physical exertion, increases heart rate and muscle flexibility. It can also boost the body’s tolerance to conventional lymphoma cancer treatments, such as, chemotherapy and radiation. Taking part in a daily exercise program can also help the patient gain a sense of physical control over their condition, and provide a healthy outlet for stress and anxiety. Exercise programs that combine range of motion with other light activities like resistance training and aerobic exercise will provide positive health benefits. The Borg Scale of Rating of Perceived Exertion (RPE) is most often used during exercise because of the limiting qualities of cancer treatments." The physical therapy intervention that is most effective in providing an increased quality of life and improved endurance is Aerobic Exercise. Helping patient's maintain an active lifestyle increases their chance of survival. Instructions in a home exercise program (HEP) that consists of ankle range of motion, lower extremity strengthening and aerobic exercise can help them maintain normal gait mechanics and allow a quicker recovery after treatment. Effects of Physical Therapy on Acute Lymphoblastic Leukemia. The differential diagnosis of Non-Hodgkin Lymphoma involves the ruling out of obvious and common conditions as well as other possible malignancies. The exact diagnosis hinges on the histological findings and the opinion of an experienced hematopathologist. "In patients with cervical adenopathy (enlargement or disease of glands), infections, including bacterial or viral pharyngitis, infectious mononucleosis and histoplasmosis must be excluded. Other malignancies, such as nasopharyngeal and thyroid cancers, can present with localized cervical adenopathy and axillary adenopathy is a common metastatic manifestation of breast cancer. Mediastinal lymphomatous involvement must be distinguished from infections, sarcoidosis and other thoracic neoplasms." ↑ 1.0 1.1 1.2 1.3 1.4 1.5 1.6 1.7 Goodman, Snyder. Differential Diagnosis for Physical Therapists: Screening for Referral. 4th Ed. Philadelphia: WB Saunders; 2003. ↑ 2.00 2.01 2.02 2.03 2.04 2.05 2.06 2.07 2.08 2.09 2.10 2.11 2.12 2.13 2.14 2.15 2.16 2.17 2.18 2.19 2.20 2.21 Goodman C.C., Fuller, K.S. Pathology: Implications for the Physical Therapist. 3rd Ed. Missouri, Saunders; Elsevier; 2009. ↑ Drug Information Online: Non-Hodgkin's Lymphoma Medications. 2000-2010; 2010-03. Available from: (http://www.drugs.com/condition/non-hodgkin-s-lymphoma.html).